Is there anything Apple can’t do? First it revolutionized the personal computing business. Then, with the launch of the iPod in 2001, it forced the music industry to change its tune. Against initial market reservations, the company succeeded at making Star Trek-like tablets hip when it released the iPad in 2010. And in Q1 2015, a record 75 million units of its now-ubiquitous iPhone were sold around the globe. The smartphone’s operating system, iOS, currently controls a jaw-dropping 89-percent share of all systems worldwide, pushing the second-place OS, Google’s Android, down to 11 percent from 30 percent just a year ago. As you might already know, the company that Steve Jobs built—which we own in our All American Equity Fund (GBTFX) and Holmes Macro Trends Fund (MEGAX)—is history’s largest by net capitalization. In its last quarterly report, Apple posted a record $75 billion in revenue and is now sitting pretty on a mind-boggling $180 billion in cash. Many analysts believe the company will reach a jaw-dropping $1 trillion in market cap. So what’s Apple’s next trick? How about moving the world’s gold market? This April, Apple will be venturing into the latest wearable gadget market, the smartwatch, joining competitors such as Samsung, Garmin and Sony. All of the models in Apple’s stable of watches look sleek and beautifully designed—just what you’d expect from Apple—and will no doubt be capable of performing all sorts of high-tech functions such as receiving text messages, monitoring the wearer’s vitals and, of course, telling time. But the real story here is that the company’s high-end luxury model, referred to simply as the Apple Watch Edition, will come encased in 18-karat gold. What should make this news even more exciting to gold investors is that the company expects to produce 1 million units of this particular model per month in the second quarter of 2015 alone, according to the Wall Street Journal. That’s a lot of gold, if true. It also proves that the Love Trade is alive and well. 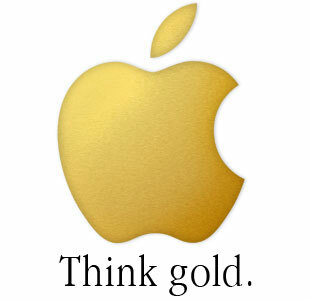 Apple chose to use gold in its most expensive new model because the metal is revered for its beauty and rarity. To produce such a great quantity of units, how much of the yellow metal might be needed? If Apple makes 1 million Apple Watch Edition units every month, that equals 24 million troy ounces of gold used per year, or roughly 746 metric tons [or tonnes]. 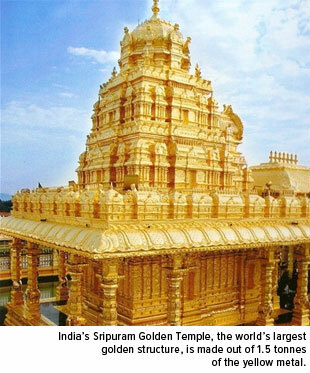 To put things in perspective, the Sripuram Golden Temple in India, the world’s largest golden structure, is made from “only” 1.5 tonnes of the metal. TidBITS acknowledges that the amount of gold is speculative at this point. Two troy ounces does seem pretty hyperbolic. But even if each luxury watch contains only a quarter of that, it’s still an unfathomable—perhaps even unprecedented—amount of gold for a single company, even one so large as Apple, to consume. Ralph Aldis, portfolio manager of our Gold and Precious Metals Fund (USERX) and World Precious Minerals Fund (UNWPX), likens the idea of Apple buying a third of the world’s gold to China’s voracious consumption of the metal. As I mentioned last week, China is buying more goldright now than the total amount mined worldwide. “If the estimates of how much gold each watch contains are close to reality, and if Apple’s able to sell as many units as it claims, it really ought to help gold prices move higher,” Ralph says. But Can Expectations Be Met? Here’s where this whole discussion could unravel. Although we don’t yet know what the Apple Watch Edition will retail at, it’s safe to predict that it will fall somewhere between $4,000 and $10,000, placing it in the same company as a low-end Rolex. With that in mind, are Apple’s sales expectations too optimistic? Possibly. But remember, this is Apple we’re talking about here. Over the years, it has sufficiently proven itself as a company that more-than-delivers on the “if you build it, they will come” philosophy. Steve Jobs aggressively cultivated a business environment that not only encourages but insists on “thinking different”—to use the company’s old slogan—risk-taking and developing must-have gadgets. A perfect case study is the iPhone. When it launched in June 2007, the cell phone market was decidedly crowded. Consumers seemed content with the choices that were already available. Why did we need another phone? Yet here we are more than eight years later, and as I pointed out earlier, 75 million iPhones were sold in the last quarter alone. So it’s not entirely out of the realm of possibility for Apple to move 1 million $10,000 Apple Watch Editions per month. Early in January I shared the following chart, which shows various analysts’ Apple Watch shipment forecasts for 2015, ranging from 10 million to 60 million units. Of course, all models are included here, not just the luxury model. Looking at it now, many of the predictions seem a little understated. After all, Apple hasn’t released a dud product in at least two decades (remember the Newton?). 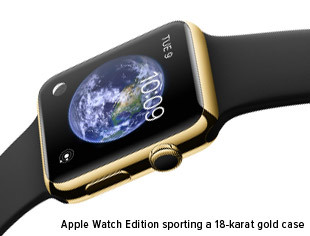 Come April, we’ll see for sure what the demand really is—for the Apple Watch as well as gold.